It may have only been a Thursday, but “A Reason to Drink...Another” tour made it feel like the start of the weekend. 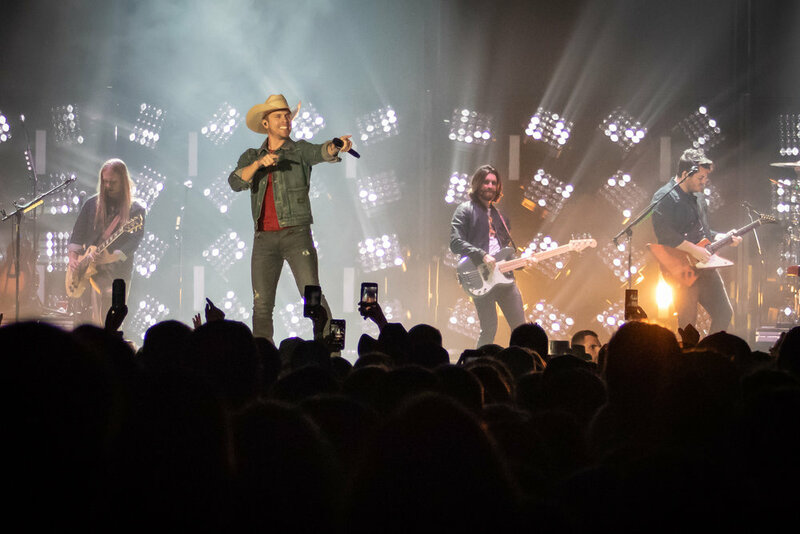 Lauren Alaina, Dustin Lynch, and Cole Swindell were the perfect trio to show a Minneapolis crowd a real party. The show took place at the Armory, a fairly new venue that is sure to become a favorite for many. This was the first visit to the venue for many country fans and it’s safe to say that there will be many more country shows at the Armory in the future. Lauren Alaina was the first to take the stage and it was a special night for her for two reasons. First, Lauren was celebrating her 24th birthday, which the band had prepared a happy birthday song for her. Second, she found out that night that “What Ifs” sung with Kane Brown, went four times platinum. Her happiness and excitement radiated on stage. Lauren did more than just sing for us, she rocked out. She came out on stage to the song “Fat Bottomed Girls” by Queen and even did her own cover of “Paradise City.” Lauren kept the fun going when she brought up a man from the crowd to dance were her to her own song “Next Boyfriend.” If you missed Lauren Alaina this time, you will not want to miss her when she comes back this summer to Brainerd for Lakes Jam Festival. Lauren Alaina set up the crowd to get rowdy for Dustin Lynch. Lynch came out singing “One Hell of a Night” and immediately was ready to party. Right away into his set, he pointed out a man near the front and got the crowd to chant “chug, chug, chug” as the man slammed his beer. Not to worry, Lynch tossed him a cold, unopened beer to reward him. Not only did Dustin Lynch bring a lot of country with his twang and cowboy hat, but he even sang a short cover of Drake and got everyone rocking out to “All the Small Things” by blink182. You could feel the floor moving as everyone jumped to the beat and smoke from the stage shot up. The fun continued when Lynch brought Lauren Alaina back on stage to help him sing “Love Me or Leave Me Alone,” which they both used powerful voices to belt it out. Lynch’s guitarist was from the neighboring state that all Minnesotans have a love/hate relationship with, Wisconsin. As soon as it was announced the guitarist was a Packer fan, the crowd erupted in either boos, woos, or SKOL chants. 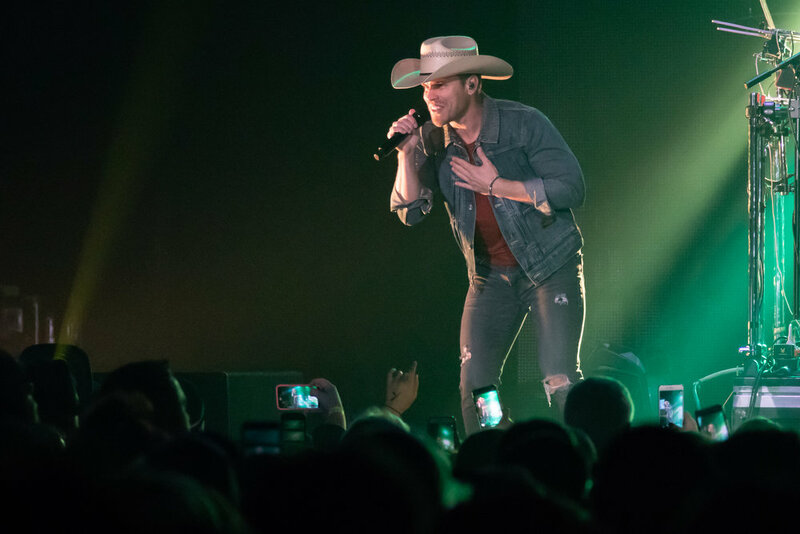 Dustin Lynch definitely brought the heat to a cold Minnesota night. With the crowd officially amped up, Cole Swindell stepped out on stage with everyone screaming. 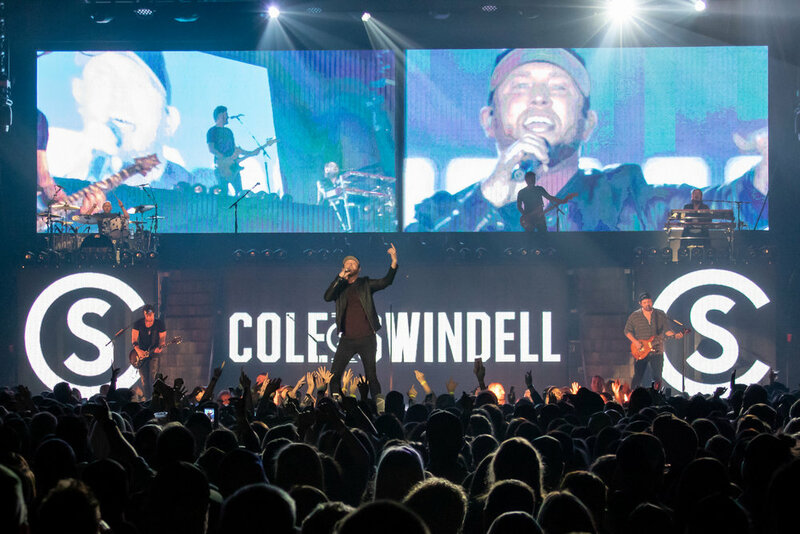 After writing so many hit songs for other artists, Swindell now has eight number one singles of his own and a new album that was recently released. 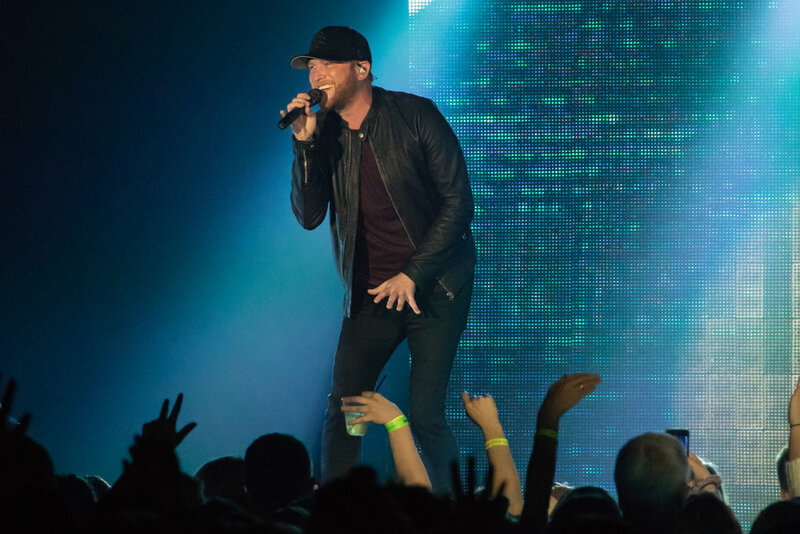 While Swindell had lots of energy throughout the show, he sang two songs back to back that slowed things down and that he encouraged people to relate to. “Dad’s Old Number” was the first one he sang from his newest album, and a crowd favorite “You Should Be Here” was sung second in memory of Swindell’s father. Swindell mentioned several times how much he loves Minneapolis and we showed him some love right back. After a short break, he returned to the stage in a Vikings jersey. Not only did he just have a jersey on, but he brought three of our very own Vikings players to the stage to surprise fans. Swindell ended the show by bringing Dustin Lynch and Lauren Alaina back on stage to sing with him some incredible cover songs showcasing all their talent together. This tour with three amazing artists was sure to be one of the best of the year. The trio had undeniable chemistry on top of their outstanding artistic abilities. This show will be one that is unforgettable for Minnesota country fans and we will be counting down the days until they are all back again!